Win Kittivatcharapong and Stig Regan go up for a block. Mark Piorkowski extends to knock it over the net. John Bucy and Mark Piorkowski reach to get the block. Win Kittivatcharapong tips it over the net. 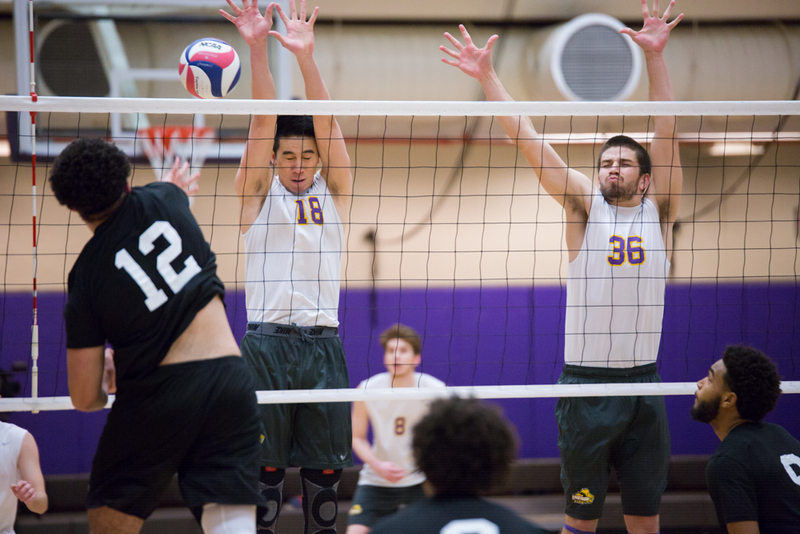 Emerson’s men’s volleyball team dominated Pine Manor Saturday afternoon in a three-set, season-opening sweep. The Lions rarely struggled, winning each set by at least 14 points. Sophomores Mark Piorkowski and Win Kittivatcharapong led the offense with 12 and 11 kills, respectively. Junior Nick Rusk provided 32 assists. Freshman Diego Garcia played a strong match in his debut with the Lions, posting a .600 hitting percentage and seven kills. Garcia said he thinks the team’s resistance to adversity will be tested as the season continues, and he complimented Nick Rusk’s setting in the match. Coach Ben Read echoed Garcia’s sentiments about Rusk’s first match as the team’s main setter. Read said he was pleased with the team’s consistency in its passing game, though he noted there are tougher teams to come this season. Read highlighted the Lions’ match against MIT Tuesday, Feb. 4. MIT swept Emerson (9-16 last year) in straight sets in both 2016 meetings. Before the MIT match, the Lions face Newbury College at home at 7 p.m. Tuesday.